CAPpings - Home Remedy for Corrosion - Affection with Family Favorites prompts maintenance of old cookware - How to clean and season old and rusty Cast Iron pan? Affection with Family Favorites prompts maintenance of old cookware - A Home Remedy for cleaning and seasoning old and rusty Cast Iron Pan. We all love our mothers' old pots and pans, simply because they have been great companions to all the delicious and nutritious meals moms cook for us all these years. There must be at least a frying pan in the kitchen that has been there since as long as we can remember, and it usually is the family's favorite one. The only problem is, any cast iron will rust eventually, even if it takes a few decades. Removing surface rust from the family's favorite cast iron skillet could be agonizing, if you don't know the correct way of doing it. 1. 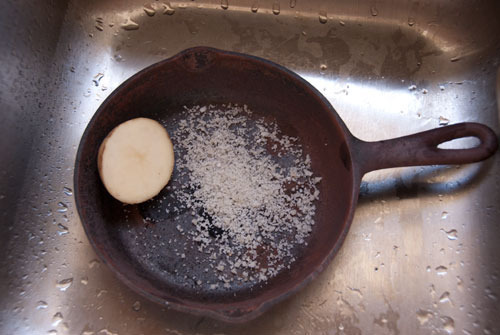 Place your rusty skillet in the sink and sprinkle a couple tablespoons of salt into it. 2. Take your chunk of potato and start scrubbing. The moisture from the potato will be enough to help the salt dig in to the rust. 3. The salt will get dirty very quickly. You may choose to rinse out the pan to survey your progress. If there is still rust, add more salt and repeat Step 2. 4. Continue to the sides, edges, bottom and handle of your pan. 5. Rinse thoroughly and pat dry. 6. Place pan on stove burner, this will help dry any remaining moisture. 7. Once dry, put a small amount of vegetable oil in the pan and rub it in with a paper towel. 8. Keep pan over low heat for at least 30 minutes. 9. Let skillet cool. Make sure to wipe off any excess oil before storing your skillet. If you leave extra oil in the pan it can turn rancid. 10. Every time you use your pan, after you've cleaned it put the pan on a low burner and repeat the oil and paper towel step. It's best to store your pan in the oven, but it worked much better when stoves had pilot lights that stayed on (thus keeping ambient moisture away from your pans). Your seasoned and loved cast-iron skillet will now looks brand new! Corrosion of drinking water pipelines is posing the threat of contamination in Chennai - Finally, waking up to the threat of water contamination in the city, Metrowater has started replacing pipelines. More than 2,300km of pipelines that criss-cross the city were laid in the mid 1960s. 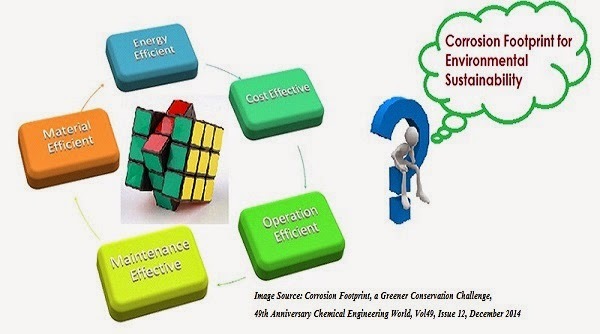 Now, many of them may have corroded, leading to seepage of sewage and other impurities into the pipes. 650km water pipes changed, twice as much still to go. CHENNAI: Finally, waking up to the threat of water contamination in the city, Metrowater has started replacing pipelines. More than 2,300km of pipelines that criss-cross the city were laid in the mid 1960s. Now, many of them may have corroded, leading to seepage of sewage and other impurities into the pipes. Public health experts say this is a crucial step in preventing waterborne diseases. Metrowater has got Rs60 crore under the Jawaharlal Nehru National Urban Renewal Mission (JNNURM) to replace all the drinking and sewerage water pipelines within the older city limit. The department had identified'more than 2,000km of pipelines along 15,000 roads. About 650km of pipelines running under areas such as Guindy, Virugambakkam, T Nagar, Saidapet, Choolai, Royapuram, KK Nagar and Villivakkam have been replaced with new ductile iron and mild steel pipes. "Most of the pipelines in the old areas were of cast iron, which rust over time. We will replace the old pipes by December-end," said a Metrowater official. The organization has been facing problems clearing sewerage and supplying drinking water. The city has around five lakh water connections. Leaky pipelines are the main cause of water contamination. "Only if there are leaks do sewage water seep in. The liquid also overflows on the road only when the links are weak, and not able to withstand pressure," said former assistant city health officer Dr Damodaran Reddy. Health officers say water contamination happens frequently during monsoon, which is why Metrowater increases the chlorine content in water by five times. Experts also feel that having a common enclosures for garbage collection in neighbourhoods could have also aggravated the problem.